James Fraser Scott Looking Backwards c.1897-1932, oil on canvas, Collection of the Sarjeant Gallery Te Whare o Rehua Whanganui. Gift of the artist’s family, 1954. Close-up view of the label on the back of the James Fraser Scott ‘Looking Backwards’ frame. An artwork that carries a visual trace of its history is Looking Backwards by James Fraser Scott (1877-1932). 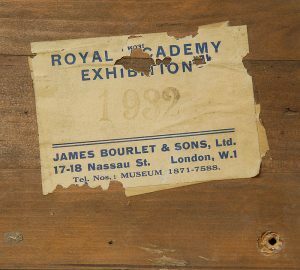 A label on the back of this work identifies that this painting was exhibited at the Royal Academy Exhibition in London in 1932. Encouraging me to dig a little deeper, this simple label opened a gateway to the artist’s life story and revealed something about the place of this work in his artistic career. Born in Roslyn, Dunedin in 1877, Scott studied at the Dunedin School of Art before heading to Europe in the 1890s where he continued his studies first at the Académie Julian in Paris, and later in Munich, Antwerp and Italy. 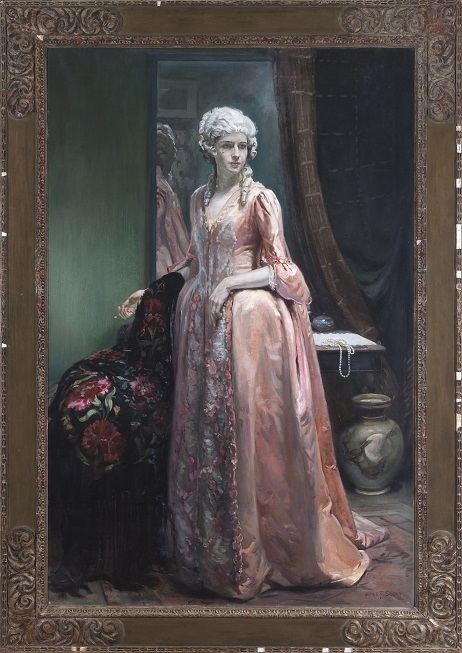 In 1902 the artist established a studio in London, but soon returned to the southern hemisphere, stopping briefly in New Zealand before relocating to Australia. In May 1916 the artist joined the World War I efforts, enlisting with the Australian Imperial Force. He served in France and Belgium before being selected in May 1918 to work as an artist for the Australian War Records Section. Scott produced many illustrations and paintings in this role, first from the field and following armistice from a studio at St John’s Wood, London. When the commission ended in 1920 he remained in London, subsisting on a small war pension and struggling to make a living as an artist. He died on 25 April 1932, penniless and in tragic circumstances. Mere hours before his death the artist received news that his long-held ambition had finally been achieved, with one of his paintings, The Sculptor’s Studio, having been accepted for exhibition in the prestigious Royal Academy Summer Show. The label on the verso of Looking Backwards, which is dated the same year, indicates that it joined this work on exhibition at the Academy. Two other works are also known to have been accepted for display. In the wake of Scott’s death, over 240 works were sent from his studio to his family in Dunedin. The family later donated Looking Backwards to the Sarjeant Gallery in 1954. The Royal Academy Exhibition label remains as a reminder of Scott’s ambitions and his achievements as an artist abroad.